This oil is good for those folks who wish to increase their strength, courage, force, and will. Add power to life's situations which call for triple strength, virility, mental force, courage, strength. 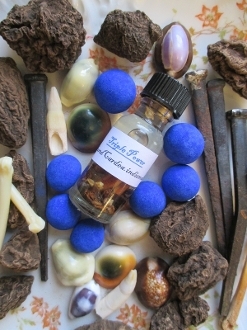 Combine with one of my fast luck or money drawing oils to triple your money making power. Combine with one of my love oils to triple the strength of your relationship or magnetism. Created with calamus root, aloeswood, benzoin, mace, lemon and more.